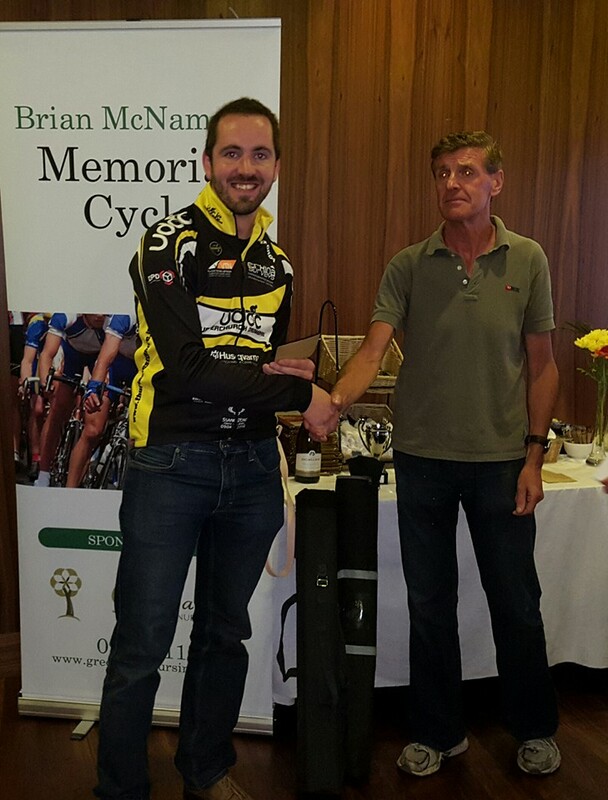 Jerry Ryan & Micheal Cahill were the clubs representatives at the Brian McNamara memorial in Tuam this year. Jerry was taking part in the A3 race while Micheal tackles the A4 race. A wet and windy morning in Tuam led to some very slippery roads and the need for caution. Unfortunately a crash in the A3 race brought down alot of riders, and while thankfully Jerry managed to stay upright, the delay of being caught up behind the crash caused him to lose contact with the main group – not what was needed on a windy day. Jerry battled the elements and came in just behind the heavily reduced peloton. The A4 race thankfully had no incidents, but with the strong headwinds, no rider could get away from the main bunch. In a long fast finish Micheal worked his way up through the bunch for the sprint finish and crossed the line in 6th place for the second year running in Tuam.